INSPECT helps Engineers safely extend equipment remaining life and inspection intervals. It can determine if your fixed equipment can support changes to process variables like temperature, pressure and fill height. INSPECT also helps your facility meet OSHA and EPA requirements by producing detailed RAGAGEP compliant documentation for pressure vessels, heat exchangers, piping and tanks. INSPECT not only manages your inspection data it shows it on the equipment in 3D too. INSPECT’s exclusive 3D plant modeling for Inspection and Pressure Equipment Engineers makes it possible to organize corrosion loops into one intuitive 3D interface. INSPECT can perform a fitness-for-service damage assessment on a single pipe spool or model an entire process system; it’s up to you. INSPECT’s fitness-for-service equips Engineers with the tools they need to determine if it is safe to continue operating damaged piping and vessels and avoid un-planned shut-downs. INSPECT also performs ASME® compliant equipment de-rating simulations to find the longest equipment life permitted by Code. These tools help to keep lines running, extend inspection intervals and minimize capital expenditures. INSPECT also reduces IT, training and software maintenance costs by consolidating software modules from multiple vendors. INSPECT is the one program, one install solution for mechanical integrity and fitness-for-service. It covers piping, tanks, pressure vessels and heat exchangers – no additional software or custom programming required. INSPECT’s rigorous RAGAGEP based calculations permit the use of higher allowable stresses and joint efficiencies. This in-depth analysis can safely extend both equipment remaining life and inspection intervals resulting in considerable cost savings. Eliminate the overhead costs involved with in-house programs. Your engineers are more productive when they are not writing, debugging and updating spreadsheets. The finite element analysis (FEA) capabilities required to perform API 579 FFS assessments of crack-like flaws, including the FEA engine itself, are included. 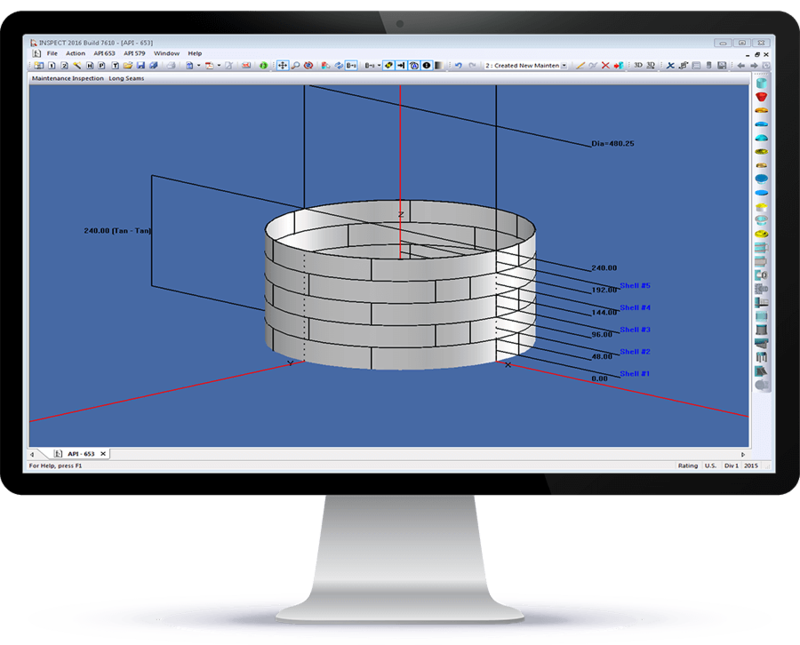 No expensive third party FEA systems are required. Shutdown inspections often find previously undetected damage and production needs to know if the equipment can be put back into service as soon as possible. INSPECT helps avoid mistakes in these circumstances by providing Engineers with a number of unique features. INSPECT’s 3D graphics provide visual confirmation that the equipment and the damage have been input correctly. INSPECT’s detailed reports allow Engineers to verify the supporting calculations for themselves. The easy to use and yet rigorous fitness-for-service analysis performed by INSPECT reduces the risk of making the wrong decision while keeping things on schedule. Older equipment is often un-documented, a situation likely to draw a safety inspector’s scrutiny. INSPECT produces detailed RAGAGEP documentation for inspectors to review. INSPECT evaluates carbon steel materials for susceptibility to brittle fracture per API 579 Part 3. Material composition screening as recommended by The National Certified Pipe Welding Bureau (NCPWB) can also be performed. 3D plant layout programs are great for new construction activities; they were developed for that purpose. But what about your facility’s on-going maintenance needs? 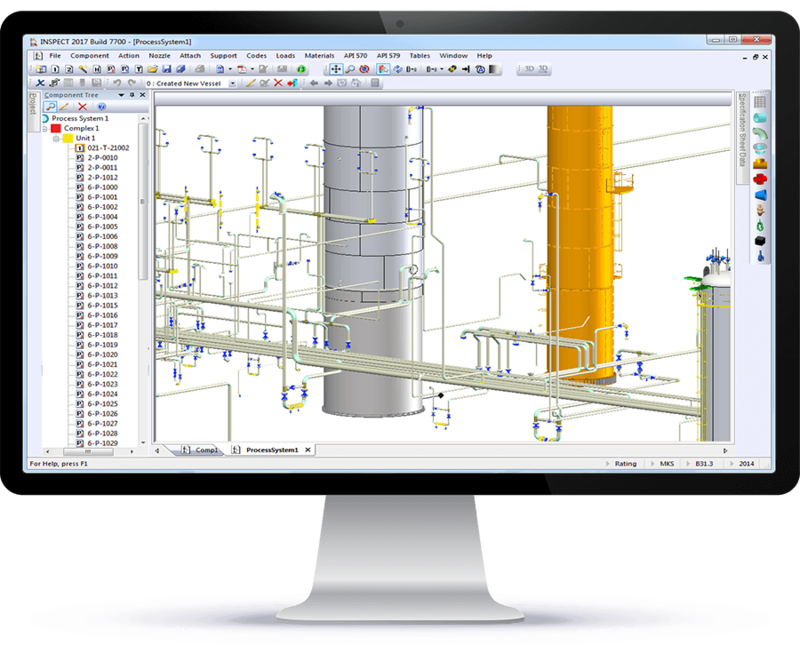 INSPECT addresses this by providing 3D plant modeling specifically for Inspection and Pressure Equipment Engineers. Engineers throughout your company can use INSPECT’s Process System Document to organize corrosion loops into one intuitive 3D interface. No need to search through endless, text-based tree lists. Quickly find what you need when you need it. 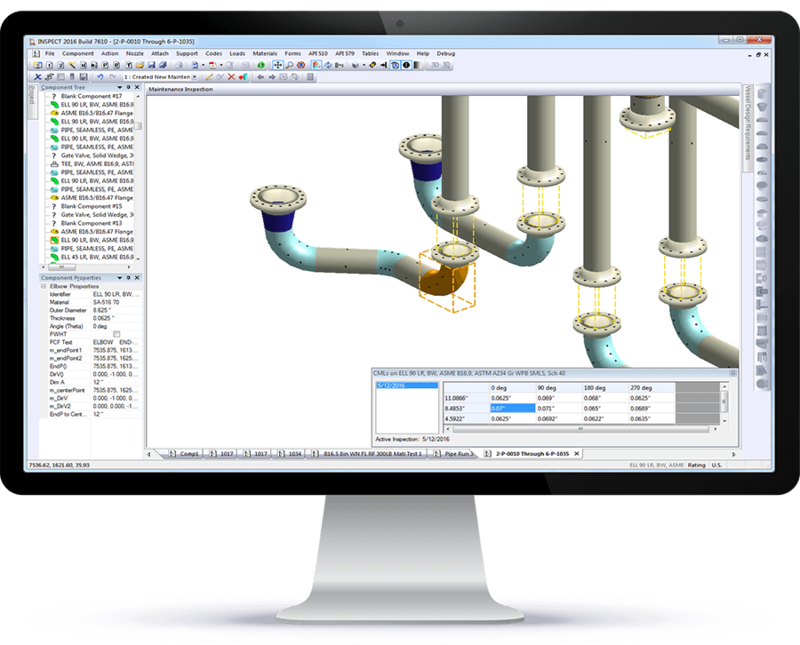 To save time, INSPECT can import piping systems from any ISOGEN® compliant software that supports the industry standard .pcf file format. INSPECT can load laser scanned piping systems produced by Leica® Geosystem’s automated Pipe Run feature. 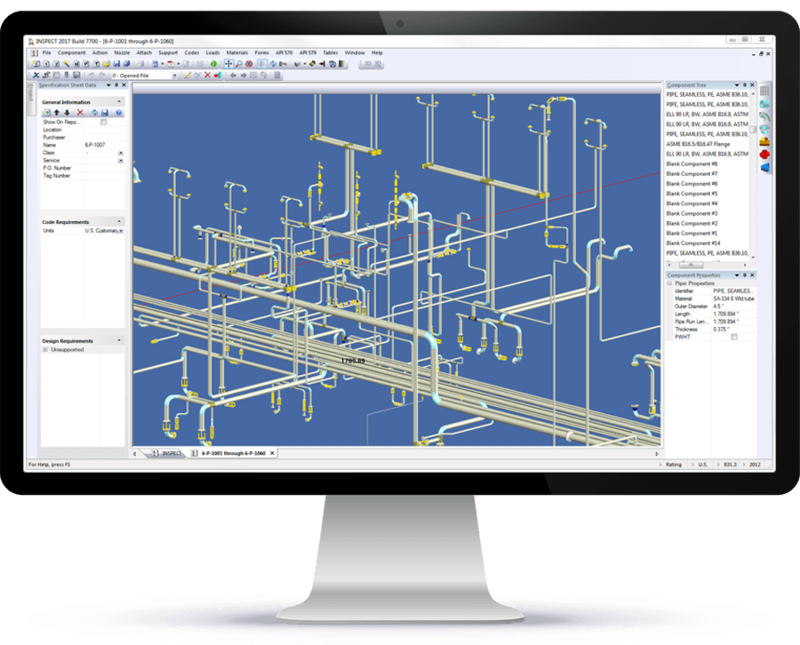 If no model is available, our easy to use piping layout interface speeds that process as well.